Spring is here. Lovely mainly with all the blossoms and scents. However, there is a crazy element that plays frenetically daily now. 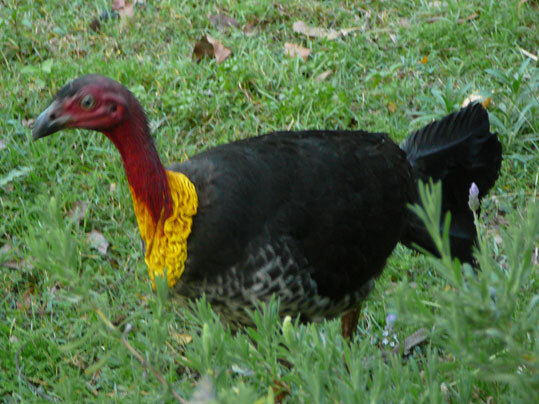 The old bush turkey, Chook, is at it again. Chook has visions of grandeur that takes shape in the form of a large and messy mound, which is strategically placed next to the vegetable garden. That mound seems to be growing by the minute. It would seem he intends his mound to be bigger than the blue one people go into. Chook has been a good experience of learning to live and let live and to respect and compromise. Sometimes more drastic measures are needed, but on the whole we seem to have moved past the first encounter when the garden became a shambles and Brian was driven to utter distraction. He did call Chook by various names, mainly after despots and tyrants who met unpleasant ends. Otherwise he refers to him as Monster. Now Chook works around us and we him but sometimes he gets a little forgetful and a reminder or two needs to be given. Personally I mostly enjoy and am fascinated by the mayhem and silliness. It brings to mind a book that my sister and I were given as children. Little Sambo is given a smart new coat by his mother. A tiger sees him and wants the coat so a chase begins, more tigers joining in, running around and around a tree till eventually the tigers melt and turn into butter. Those turkeys do a similar chases around and around the ponciana tree, it is so utterly absurd and ridiculous. Chook and his entourage are quirky, eccentric characters. Every morning, and at dusk, the turkeys come up to the house and the chase begins as Chook struts his territory asserting his superiority and claim over the front yard as well as my attention. When he spots another turkey, bird or even wallaby he charges. The girls run, fly, scramble into trees and on the roof, as if in pure panic, then turn and attempt to sneak back. Chook waits and pounces; then it is all on again and again and again…….. a slapstick show that plays and replays constantly. Usually a collection of diverse bird life and a few wallbabies are on the lawn for the show. Bronze wing pigeons flap and alarmed stir up the other observers. The wallabies dash in all directions, though a couple now have worked out the mini drama and just sit back and consider that daily disturbance. The cockatoos let rip with their loudest bloodcurdling and best screeches. Added to this melee the the brazen lorikeets arrive, screeching even more piercingly and also chasing whatever takes their fancy, as they bully all and sundry. Fur and feathers fly. The two butcher birds sit on the verandah rail, just watching and, I suppose, wondering at the silliness of it all. It can get quite exhausting. Chook seems to have limitless energy to chase as well as to scratch and shift debris. I suspect he thrives on the turmoil that his chase triggers and has a good chuckle to himself as he plans the next foray. The mound could actually be very helpful. 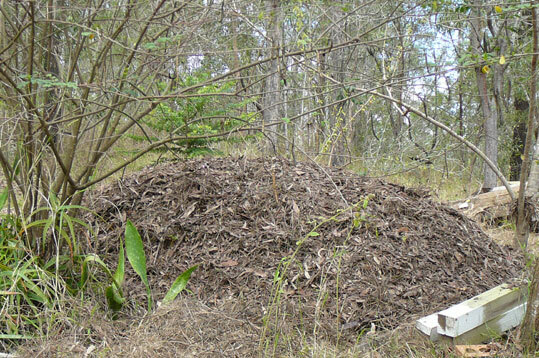 I see a wonderful potential compost heap after it has been used, and Brian sees the litter that needs clearing for fire protection, steadily moved to one spot. Chook has done rather well this year and is now dragging leaves, dry grass, gravel, twigs and even branches up the hill and to the site. He turns the mound most days and the girls observe, occasionally investigate and scratch about and in it. So far, over the last three years that the mound has been located so close to the house, no chicks have emerged but perhaps this Spring that miracle might happen. To add to the mayhem another male has earmarked the mound and we suspect there is an element of sabotage happening. As well the younger male has decided to scratch up the garden removing several plants and damaging others, plus leaving trails of litter. Loss of the plants has upset me as these were chosen to attract and protect smaller birds as well as to assist in restoring the bush. By now the wear and tear of several years of turkey shambles is again starting to test patience and endurance till I venture outside and twoof the femaleturkeys run to me muttering a welcome and seem so happy to have my company. All over again a huge wave of fuzziness engulfs and gives such an intense feeling of humility and gratitude to be part of this web of life, to be allowed to observe so closely and to be trusted. One of the “chickies” has worked out where my bedroom is. She pecks at the window, strutting up and down the verandah, muttering, knocking on the glass and insisting that it is time to arise and face the day and be a friend- NOW! Rarely do I sleep in. I suspect there could also be the ulterior motive of getting into the house. That thought is not a comfortable one so I tend to be somewhat paranoid about keeping doors closed – also to stop snakes and rats entering; but that’ another ramble, sometime. The other indicator that Spring and courtship is in the air is our current visitor. In my childhood dreams and long since, I have tried to imagine what it would be like to have a real koala in a tree in our yard. As if in a dream that has happened a few times over the nine years that I have resided in Queensland. Each time is an exhilerating and awe inspiring event. What is even more amazing is that this location is close to suburbia and all around extensive development and removal of habitat . Next door is a working quarry and a few hundred metres away busy roads. This big lad has been grunting at night and seems to like the wedge of this branch. He has been here for over two weeks snoozing mostly. At dusk ,and occasionally during the day, he stirs and goes climbing higher to pick leaves. Each glimpse of him is much cherished privilege. I would hope that generations to come would be so blessed, though with current trends it is very unlikely. Today, however, I will hope and live in hope. I will wish for a future that allows others to observe and enjoy nature revelling in the season and in their freedom.